From the first day of beginner band, getting the embouchure right may be the biggest concern for the future of each young trumpet player. The proper initial embouchure combined with frequent reinforcement will best assure that a young player will be successful in the future. A poor embouchure might allow a young player to succeed at the earliest stages, but sooner or later it will cause the student to hit a wall. I have had to “re-teach” embouchure to high school and college students whose bad embouchure habits have raised insurmountable barriers, and the frustration with which they deal is almost overwhelming for them. In fact, for some of them, it is overwhelming to the point that they decide to quit playing altogether rather than start over. By high school, the results of a bad embouchure will be a deficient tone quality, poor intonation, lack of endurance, weak range (both low and high) and no flexibility. 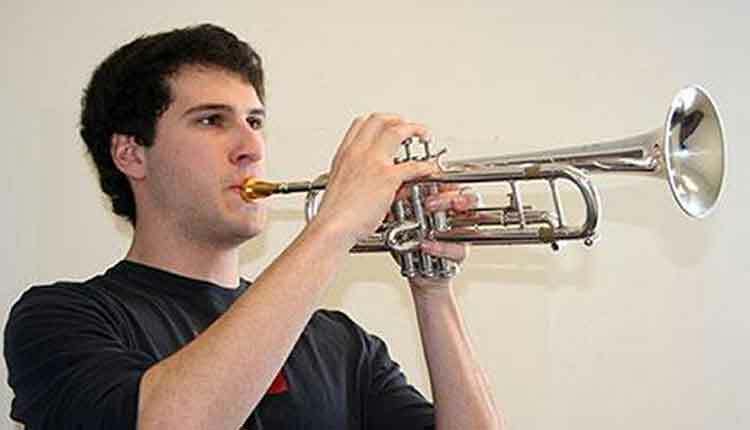 With the proper embouchure all of these aspects of trumpet playing are almost guaranteed to be at least pretty good, and they certainly all have the potential to be great. Naturally, there is more to good trumpet playing than just a good embouchure. A constantly moving air stream is essential to good playing, but sufficient air cannot overcome a bad embouchure. Here is a 7-step embouchure checklist that teachers of beginners should reinforce daily. Keep all of the red of the lips inside the cup of the mouthpiece. Number seven is the deal breaker for the student’s future. If your student takes his/her horn down and you see a semi-circle on the red of their upper lip (see figure A), their days are numbered. The inside rim of the mouthpiece must rest no lower than the line that divides lip from skin (see figure B). I have seen some students play with the mouthpiece so low that some red of the top lip is actually above the outside rim. In this case it may be worth considering switching to an instrument with a larger mouthpiece, such as the euphonium or tuba if the student is only in the sixth or seventh grade. This is less of an option by high school. Also, a little deviation to the right or left of center is of no major consequence and is generally the result of the student’s teeth formation. When all is set properly, the student’s face should have a natural look. There should be no excess tightening, twisting, etc. The band director should spend five to ten seconds of every class period reinforcing the above checklist on an individual basis. Have each student play something short (perhaps even a single pitch), then give them one or two points to address for improvement. One might even have chair tests based on embouchure formation on occasion, since nothing seems to motivate young players more than a good, old-fashioned chair test. The total time should take only a couple of minutes, but there is no better way to spend part of your class time. Finally, the reinforcement of a good embouchure should continue every year. Some of the worst embouchures I have seen in those ninth grade and up are on students who had satisfactory embouchures earlier in their band career. Sometimes embouchure placement begins to migrate as students grow physically, or as more demands are placed on them. When younger students start to do well and are asked to play in a fairly high register, they frequently start pulling the mouthpiece down further on their upper lip. The smaller surface area of the upper lip within the mouthpiece cup often allows students to play higher a little easier at first, but there will be consequences later if they are allowed to continue in this manner. Reinforce the idea of learning to play high on a properly formed embouchure. They can do it, and the future remains unlimited for them if they do so. Diagram of the ring resulting from an improperly placed mouthpiece. Diagram of the ring resulting from a properly placed mouthpiece. Gary Wurtz has been the trumpet professor at SFA since the fall of 1992, and began his duties as Jazz Band director one year later. His other duties at SFA include directing the Trumpet Ensemble and performing in the Pineywoods Brass Quintet. This article is reprinted with permission from the Texas School Music Project web site (http://www.tsmp.org). This site is sponsored and produced by the music faculty at Stephen F. Austin State University with the purpose of providing practical information for public school educators, students, and all interested musicians.